At Chronicle, we love all storytelling mediums, but we especially love the written word. One of the most beautiful and functional parts of written storytelling is typography. The font, sizing, and spacing of words influences how much of the story we read, how fast we read it, and how we interpret it. For Chronicle 2, we had some help making our Authors’ stories shine. We hired Saja Typeworks to help us make reading fiction quick, accessible, and meaningful in your busy day. In this post, with a little help from our friend Aaron Bell of Saja Typeworks, we’ll get into the details of Chronicle 2’s typographic choices, what those choices mean, and why they’re important. One of the most functional improvements for Chronicle 2 is the app’s information hierarchies. Each page has been carefully designed to make it easy to read what’s important, with a priority of making our Authors’ work shine. For Playlists, we wanted an exciting, visual way to combine stories and retell them through a new medium. Here we prioritize the beautiful covers made by visual artists from around the world. For story previews, we sweat every detail in placement, size, and margin to make it easy to choose your next favorite story. Choosing your next favorite story is our highest priority, so we took extra time to make that decision an easy one. In the screenshot above, you can see that we’ve added color coding to each story telling you just how long it will take to read. The quote from each story is visually separated from its other information, and we use a different font to further differentiate the two. As for the story information, we use a different sizing and weights to convey the importance of each portion. The title is the most important part of this section, so it gets a regular weight and slightly larger size. Next up is the author name and reading time: both important parts, but a follow-up to the unique and catching title. Finally we have the story Highlights: three words that describe the story. These are the lowest priority, but they help give you a sense of the story before before diving in. Additionally, you can tap these to see more stories that share the same Highlight. Chronicle is a bridge between two storytelling mediums: the paperback and the social network. Our font reflects that blend. It combines the stylish serif of a well-worn paperback with the modern geometry of the sans-serifs you find while scrolling through news feeds. It is a very readable font, welcoming you into the experience while simultaneously disappearing underneath the story itself. With this font, we make a statement that this app is different, but also familiar and welcoming. 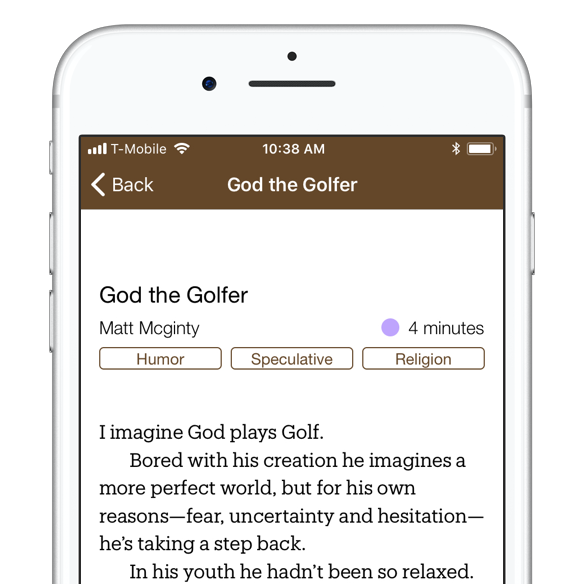 Chronicle is an app for reading during little moments of free time we find throughout our day. Because of this, it has to be easy to jump into a new world with lots of distractions around. We chose our margins to ensure lines read quick and you don’t get lost. A quick survey of Andre Payne’s “The Siren’s Song” suggests about seven words per line on the standard size iPhone. This is short enough that you can keep a whole line in your head, but long enough that each line is a meaningful portion of the story. Chronicle 2 is easy to get into and memorable as a result of its typography. We developed a clear information hierarchy so you can easily decide what to read next, with interactive elements to further that goal. We chose our font to be stylish and substantial, while also being thoroughly modern and accessible. Stories have margins that speed up your reading and improve your understanding. As you can see, typography is one of the most important elements of Chronicle’s composition, conveying the meaning of mindful storytelling in each letterform.